In their fourth successive year with kit supplier Nike, United unveiled a quality home shirt for season 2012/13. Billed as ‘retro’ style, the top featured an all tangerine body complete with the Nike swoosh and club crest. It boasted a V-neck collar and thick black trims on both sleeves. New signing for that season, Michael Gardyne, modelled the strip at the official launch. The kit continued with sponsorship from Calor Gas, again using a black and white logo design in the centre of the shirt to match well with United’s traditional colours. On the back of the shirts was a new sponsor. GA Engineering signed a two year deal with the Club and their black logo was positioned just above the player names. The shorts too came complete with a new sponsor, Digital Goldfish, who like Calor, adapted their sponsor to tie in with the look of the kit. 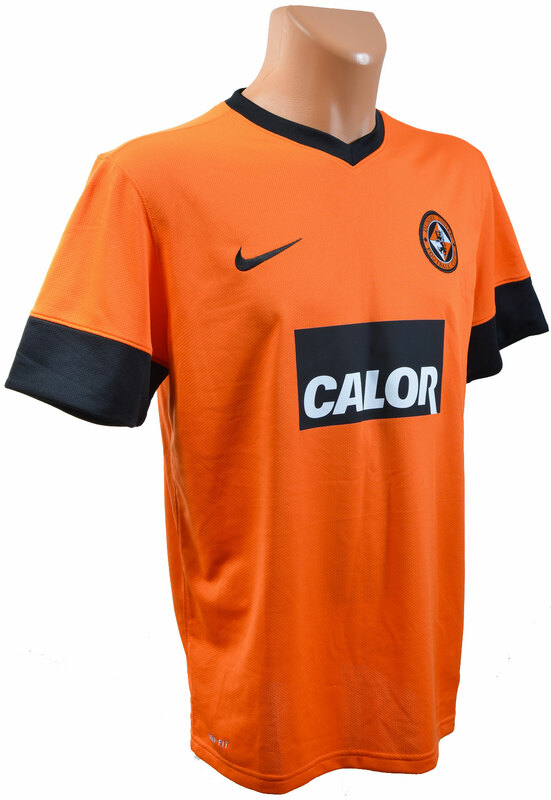 United first wore the shirt competitively in the Europa League, in a 2-2 draw at Tannadice againstDynamo Moscow. The Club had some great wins this season with 3-0 victories over neighbours Dundee and Rangers in the Scottish Cup. United’s last competitive game in the kit came at Inverness in a 2-1 win over Caley Thistle in the second last game of the season, although it was used in a couple of pre-season friendlies before the start of the following campaign. Johnny Russell was the star man in the 2012/13 season and the kit will probably be remembered in images of Russell doing his swan dive goal celebration in the opening derby match of the season.